SpicePress allows you to display your Services both on the Homepage and on the Services page. You can easily configure them with the Repeater control, and also add as many Services as you want. 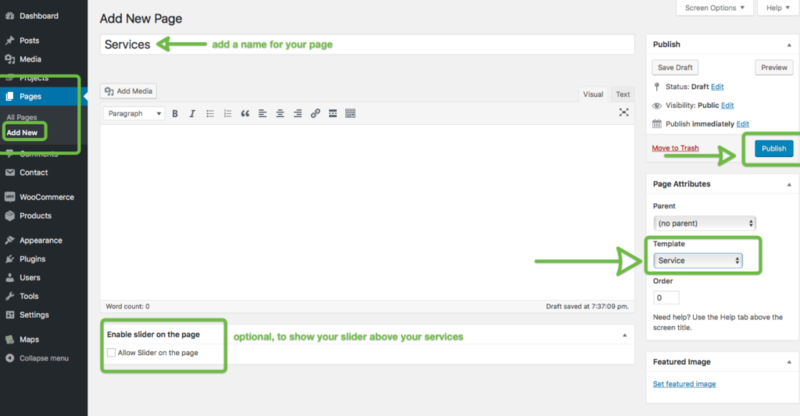 Enable services on Home Page: Hide/Show your Services section on your Homepage. Title: Add here the title for your Services section. Description: Add here the description for your Services section. Title: Title of your Service. Description: Brief description of your Service. Image Type: Select wether you want your service icon to be a Font Awesome icon, an Image, or not to show any. Image: If you chose to display an image, upload it or select it here. Icon: If you chose to display an icon from the Font Awesome library, select it here. Select Service as a template. Choose to show your slider above your Service (optional) by ticking the box on the bottom. In this panel you will have the opportunity to toggle ON/OFF all three sections.